COMPANY NAME will be a distributor of safety equipment and supplies to industrial clients. The Company will be a distributor for INSERT NAME. INSERT NAME reduces the expenses associated with processing Redistribution orders, by providing unified services and support throughout the supply chain from initial order through final delivery. 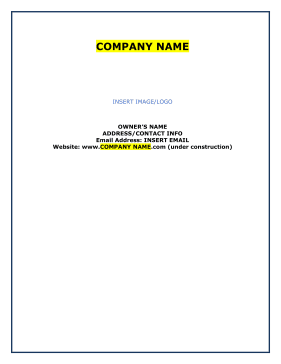 COMPANY NAME was formed in INSERT LOCATION on December 17, 2008. The Company is owned 100% by INSERT NAME. The products that COMPANY NAME will be selling and the geographic area the Company will target are all the product lines INSERT NAME supplies and the area that they have distribution centers. COMPANY NAME will sell these products and services to the mining industry, the transportation industry, general manufacturing, food manufacturing, warehousing, power plants, electrical companies, heavy highway construction, general contractors, plumbing and HVAC companies, the construction industry, and other companies that use safety industrial supplies. The Company has 200 previous customers that the owner has done business with in the past 6 years. Currently, the owner has secured 20 customers that are waiting to do business with the Company with 180 customers that have shown a willingness to purchase products upon launch of operations. The Company has a list of 5000 potential customers that are target prospects. COMPANY NAME will have in place an aggressive e-commerce campaign to target these industries across the country and bordering countries. The current financial plan for COMPANY NAME is to obtain grant funding in the amount of $276,000. The grant will be used to launch operations including leasing office/warehouse space, purchasing start-up assets and covering start-up expenses, as shown in our start-up tables and milestone table.